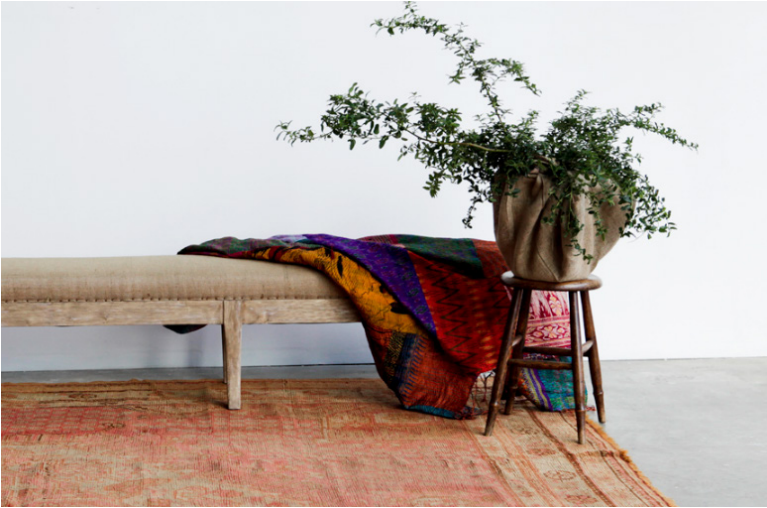 since 1965, woven founder and co-owner abraham moradzadeh has been lovingly collecting antique rugs from all over the world. his discerning eye and love of the hunt has resulted in a broad collection of antique rugs that are as beautiful as they are uncommon. markers of history that reference both the art and culture of the time and place in which they were woven, these pieces are true one of a kind works of art. 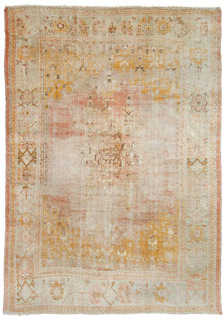 antique turkish rugs are some of the most beautiful and masterfully woven textiles in the world. created as artistic, spiritual, and functional pieces for daily life, turkish rugs are a foundational genre in the world of antique floor coverings. the history of turkish rugs extends back thousands of years and encompasses a variety of styles including tulu, karapinar, ladik, konya, ushak (oushak), kayseri (kysari), burdur, soumak, and kilim. 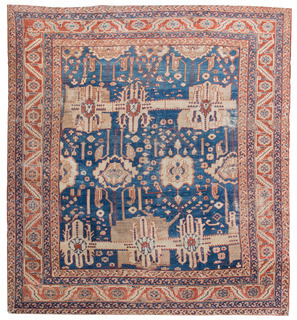 antique turkish rugs can be identified by their distinct technical characteristics and wonderfully artistic details. originally woven by nomads for practical purposes, these rugs were often constructed with wool for warmth but are sometimes found in cotton or silk fibers. the weaving itself was done by hand knotting the materials using the ghiordes knot. the weavers created their design patterns from smaller levels working to slowly build the larger vision. whether working as a community effort or as a single artist, these rugs reflect a dedication to sustained beauty and ingrained longevity. the design themes amongst turkish rugs are diverse according to regional and tribal practices but geometric patterns are the most common imagery found in antique turkish rugs. 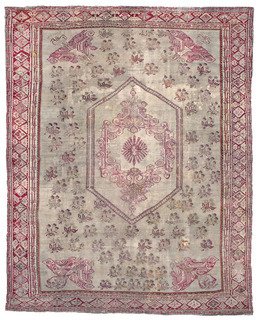 while every antique rug is unique, some of the common designs include thick borders of floral images as well as vinery with a centerpiece medallion or diamond pattern. 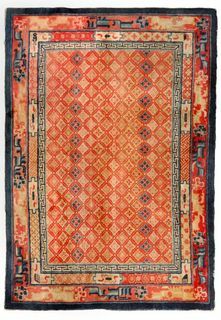 Historically, the colors often found in antique turkish rugs were dependent on the dye materials available at the time, but a common practice was the use of reds, blues, and earthy tones that eventually faded into softer pastels and subtle, soothing palettes. 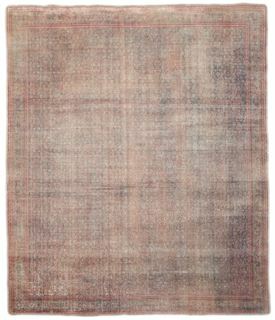 at woven, our large collection of antique turkish rugs have been personally hand selected. our team travels the world to find the best quality antique turkish rugs from master artists and collectors. our goal is always to learn as much as possible about the history and production of each antique rug to keep the legacy of every rug alive. khotan rugs are often associated with samarkand rugs due to their location near the major trading city of samarkand in central asia. this region thrived in culture and prosperity in part because it was a major crossroads for early trading between china, europe, india, persia and turkey; a node on the legendary silk road. khotan was one of the largest and most successful cities along the ancient route, an oasis in of the world’s harshest deserts, where not only goods traveled through, but also technologies, philosophies and genetics were transmitted from one culture to another. a city in eastern turkistan, now part of china, there are written records going back to 644 testifying the region produced ‘carpets and fine felt’ and a recent archeological find stumbled upon a tapestry as old as 2,000 years, while another dig in the early 20th century unearthed the oldest piece of kilim known to man, dated to the 4th century, with a weave almost identical to modern kilims. khotan was the first place outside of china to cultivate the silkworm, an industry that thrives to this day, producing fine silk rugs and textiles, and an important export. khotan rugs are well known around the world for their long, narrow and meticulously expansive design that add a sense of intrinsic beauty to any space. the dye and colors used in khotan rugs,associated with palettes of red and yellow as well as earthy shades of brown, gold, greens, are not found in many other rugs. they combine chinese details with central asian design schemes and vibrant western coloring. the decoration generally consists of lattice designs bearing clusters of rosettes, together with triple-medallion schemes in blue on red, pomegranate vines that grow from little vases, or coffered patterns showing chrysanthemum heads locked into squares. 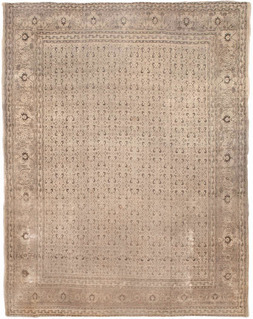 antique indian rugs have been around since the mughal dynasty of the 16th century. the earliest rugs from india were influenced by persian designs and techniques, but indian weavers soon developed their unique voice and created a style that reflected their own experiences. 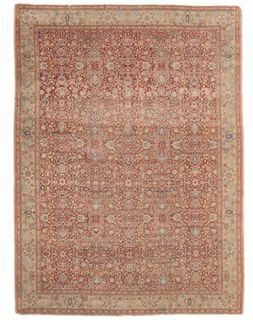 antique indian rugs are distinguishable by their asymmetrical weaving patterns and are often very large. 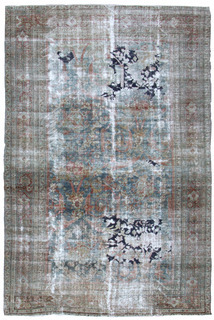 as indian rug making grew throughout the country, agra and amritsar became the two major cities producing rugs in india. these are now the two primary categories for classifying antique indian rugs. 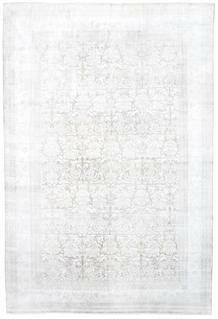 antique amritsar rugs are named after the city in northwest india. amritsar rugs differ from traditional indian rugs in that they were highly influenced by western market demands as opposed to regional practices. 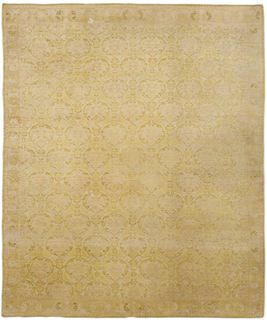 the unique details of amritsar rugs include a different grade of wool textiles and more subtle, almost minimalist, design themes. 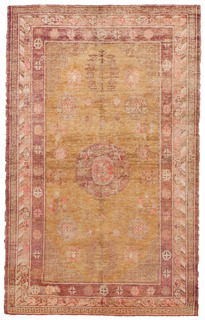 the color palette for amritsar rugs often includes soft earth tones of rich browns, mustard yellows, and light greens. 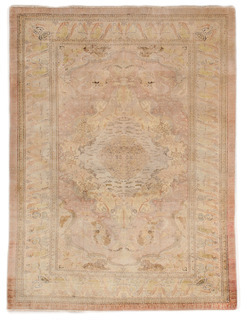 agra rugs take a bolder stance. aligning with its history of legends and culture, this popular city, home to the taj mahal, was host to a thriving arts scene including textiles. these powerful roots influenced the rug production in agra and can be seen in many of the antique rugs that originated in this city. 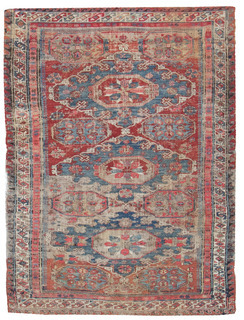 typically identified by their deeper, vibrant color schemes, these antique indian rugs deliver a strong presence even after centuries of aging. their palettes are lively and the design depictions are often intricate and energetic, drawing the viewer in and commanding a space within a room. 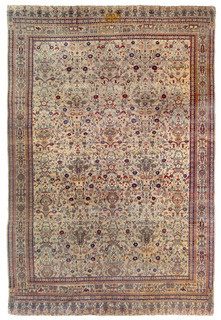 antique indian rugs convey impressive ideas of sophistication and cultivation. 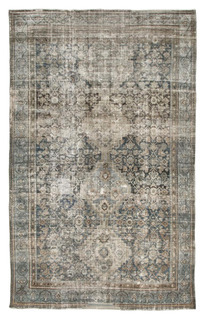 their use of mesmerizing motifs have transcended time and location making some of the most sought after rugs available. 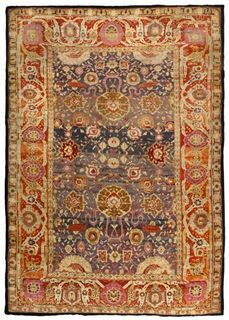 our collection includes over 200 of the most distinguished and well preserved antique indian rugs. from large scale rugs that draw the attention of an entire room with their hand knotted century-old beauty, to serene narrow rugs that graciously blend with stronger interior design elements. antique chinese rugs are at the foundation of textile history. these beautifully handcrafted rugs have been produced and perfected through centuries of experience by master weavers in china and the surrounding regions. steeped in history that runs deep into the cultural practices of the area, both religious and philosophical elements played major roles in the design of chinese rugs. besides the images that dominated these rugs, there is a common color palette often found in antique chinese rugs that includes shades of blue, apricot, yellow, and red. woven's collection of antique chinese rugs is a unique and high quality array of floor coverings that was intentionally assembled through decades of personally chosen rugs, gathered during our many travels through asia. some of the most interesting pieces include round and oval shaped rugs as well as antique carpets and rugs that burst with vibrant colors and extensive patterns. many of the chinese rugs at woven explore the flora and fauna motifs, and more specifically, lotus blossoms and chrysanthemums, that were popular symbols in chinese culture. clouds, birds, and finely detailed medallions are also found on many of our antique chinese rugs. one of the most unique pieces in the collection includes a landscape design of mountains, fields, lakes and trees using repeating patterns of wavy lines. buddhist and taoist themes are often seen in antique chinese rugs. 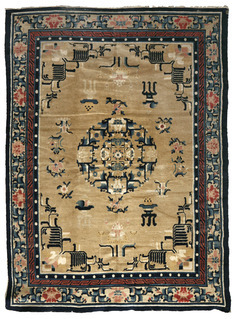 these spiritual symbols woven into the design of the rugs promote balance, good fortune, and long healthy lives. the use of these meaningful visuals in floor coverings connect the artistry of the rugs with larger ideas of divinity and purpose. they move the rugs from the realm of decorative pieces to deeply important reflections of beliefs and values. 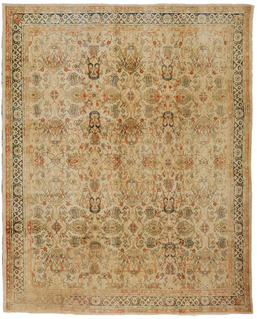 much of the iconography used in these antique rugs were meant to bestow wishes of prosperity and longevity within the homes they were placed, adding a sense of ethereal lightness and organic openness. 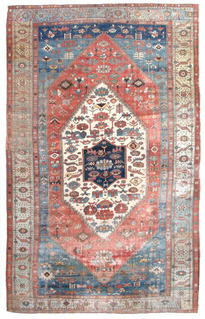 antique russian and caucasian rugs originate from a large and diverse area of the world. the multicultural background of the region is uniquely reflected in the look and feel of the antique textiles originating from this region. while russia covers a massive area filled with many ethnicities and cultures, the caucasus region may be even more so. bordered by russia, turkey, and iran, all of these rug-producing countries have influenced the design and style of our antique russian and caucasian rugs. the caucasus region is one of the most diverse places in the world with over fifty ethnic groups represented. this area has been producing rugs for centuries and has been influenced by the wide range of languages and cultural practices that inform both their weaving techniques and the design patterns. antique rugs from russia and the caucasus region are distinguishable by their lively geometrical patterns including diamonds, hexagons, small crosses and hooks. these rugs often tell the stories and folklore of the local communities through their weavings including the depiction of humans and animals in a rug’s central design. 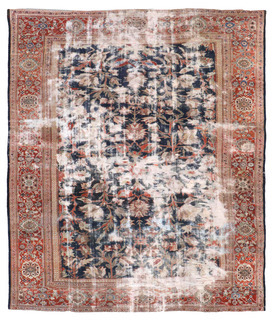 as with many antique rugs, utilizing natural materials from the immediate environment was common practice, whether it was for producing dyes or weaving thread. the colors and textures found in antique russian and caucasian rugs are very distinctive. many of the patterns found in these rugs are energized with strong primary colors that were created from the local landscape. these original details merged with the influential techniques found throughout the region such as the widely popular turkish knot being used for the majority of russian and caucasian rugs. as you look through our collection of antique russian and caucasian rugs, you will notice the divergent designs and distinct look of these floor coverings. from the bold color combinations to the sharp edges of the geometric patterns, these rugs deliver a look that is rarely seen. if your space is in need of a lively infusion of movement, color, or design, an antique russian or caucasian rug will bring new life to a stagnant or quiet room. these rugs are finely hand woven and well preserved even after being passed down through the generations. rug making was introduced to europe by the moors in spain between the twelfth and thirteenth centuries. 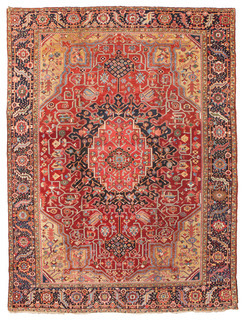 initially, oriental rugs exerted a strong influence on european rug designers. however, these rug makers developed their own unique styles and techniques with time. 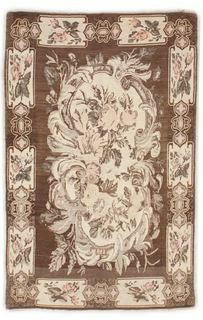 by the early seventeenth century, savonnerie was producing rugs for french palaces, as state gifts and important commissions. savonnerie became the royal manufacturer for louis xiv to louis xvi. their designs included floral arrangements, military and heraldic references and architectural motifs. only the king was able to own or sell a savonnerie carpet. 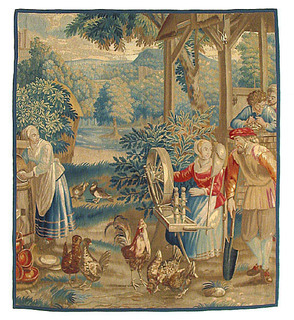 this led to rug production by aubusson. these rugs emulated the designs of the savonnerie carpets. 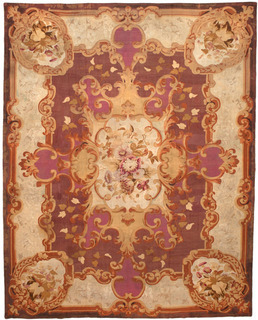 aubusson and savonnerie have since produced some of the most exceptional rugs of the last few centuries. high quality rug production in england in the late eighteenth century led to the arts & crafts rugs of the late nineteenth century.